This week in The New Yorker, James Surowiecki notices that lobster prices on Maine docks have fallen to $2.20 per pound (in July it was as low as $1.25 per pound; it was $6 in 2005), while the cost of whole-lobster dinners and lobster rolls remains as high as ever. (The price drop is due to historically huge harvests; Benjamin Wallace examined the “lobster glut” that ensued for New York three years ago.) Surowiecki points to the luxury-pricing model and invokes the old idea that lobster tastes more delicious to customers because they’re paying more for it. The psychological factors may be true, but the idea that a lobster glut at the source will inevitably translate to lower dinner bills belies several realities of the restaurant business. It takes middlemen and resellers to transport lobster from the markets in Maine and Canada to New York City, and that’s just the beginning. A number of factors, most rarely discussed outside restaurant kitchens, account for the fact that restaurant lobster is often as expensive as ever. 1. There’s a glut of the wrong kind of lobster. Lobsters molt their shells during the summer months when waters are warmer. So a sudden summertime explosion of fresh-caught lobster typically means a glut of soft-shells (as opposed to more mature hard-shells). Soft-shells may be relatively easy to unload from the docks — which is why people who eat lobster in Maine can get affordable, plentiful meat in the summer months — but they contain less meat and are more fragile (and thus harder to ship) than hard-shell lobsters. That means most soft-shells don’t leave the city where they were fished, and so customers who aren’t near the source won’t see much difference in whole-lobster prices. Another disincentive to move soft-shell lobsters: Customers will sometimes complain about them because you don’t get all the cracking-and-slurping satisfaction with a wan softy. 2. Moving, storing, and shelling whole lobsters is expensive. Whether you’re dealing with soft-shells or hard-shells, storage of whole lobsters also adds to the price: In order to survive, lobsters need fresh, cold, slightly saline water with oxygen pumped in. For wholesalers that are shipping lobsters, and any restaurant that deals in whole-lobster meals (with tanks where customers can choose their own dinner), these concerns take up significant real estate and consume vital resources. Then there’s the cost of putting a whole lobster on the table. The reason why Rebecca Charles at Pearl Oyster Bar charges $28* for a lobster roll is because the restaurant starts with whole lobsters, then pays for kitchen labor associated with steaming them, shocking them in ice water, pulling claws and tails from lobster bodies, then shelling all the meat, tails and everything, and finally chopping the meat. 3. You actually can buy affordable lobster rolls now, but they use prepackaged lobster parts rather than whole lobster. 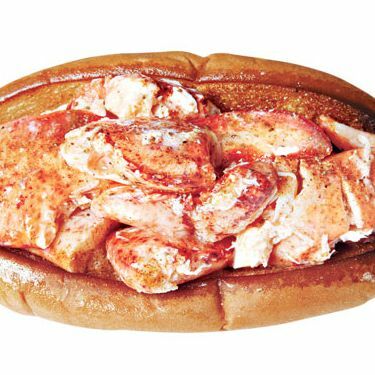 As Wallace chronicled, the lobster glut has created an explosion of relatively affordable “street” lobster rolls — like the $15 roll at Luke’s Lobster or the $16 roll from Red Hook Lobster Pound. But, by and large, these restaurants aren’t buying whole lobsters for their rolls; they’re buying meat that’s been de-shelled and preportioned in Maine. They buy claw and knuckle meat, while the tail meat, which is the most expensive part of the lobster, is typically snatched up by large food-service companies that sell it to spots like high-end hotels and luxury cruise ships. The question of whether rolls made with prepackaged or whole lobster are better is much debated in lobster circles; both have ardent supporters. But, in general, the restaurant industry wants the public to think, Lobster is lobster. It’s partly marketing, and it’s partly because the conversation is much more complex than most people think. *This post has been corrected to show that the lobster roll at Pearl Oyster Bar is $28, not $30, and that in-house preparation involves steaming lobster whole, not poaching lobster parts that have been butchered prior to cooking.